I've noticed more of a tint difference in the Nichia's than the Cree's. All six in each light was the same but noticed a difference between lights. Even if the red worked in the dragon with the battery in backwards, wouldnt the nichias light up anyways? Or would they? Just wanted to say that the LunaSol 20 looks like just about my idea of EDC perfection in an LED light. I'm really excited by the LunaSol concept in a more manageable 20 mm size. I feared that this project would never make it. But fortunately, Don came through with it. His best "production" light to date, IMHO. You have no idea (or perhaps you do) how happy that makes me while I await delivery. Hearing Don state that he could never imagine going back to single-source lighting just raises the bar/expectations to a lofty, lofty level. I can't wait. I look forward to seeing the difference (with my own eyes, not just beamshots) in the low and high beam vs the PD-S which has been my most carried light for a while now. As I just commented in the wave thread, I am essentially committed to the LunaSol 20 going forward because of its form factor. I appreciate the comments made by you guys but most important is the actual performance of the light which most have yet to experience. Although once in hand, I prefer the LunaSol 27 to the LunaSol 20, at least outside and in consideration of beam, the EDC conundrum is what is likely to be in hand. I think for most the size of the LunaSol 20 places it much more likely at being at hand, to be in hand. An aside on the red LED. If you put a battery in backwards in the LunaSol you will quite likely fry a converter. This would not give you reverse polarity on the output side of the converter where the red LED is. No doubt a converter could be designed which reversed output polarity on a signal or perhaps low voltage situation and the red LED could be lit. In the LunaSol 20, depending on how far off center the reflector sits, you may or may not see this red LED chip as a little spec down there. I haven't investigated why Osram put the chip there and the design here of this light completely ignores this chip. This light is sweet to be sure and was just what I was hoping to see (without even knowing it) after the advent of the LunaSol. I am definitely all for the EDC style lights for sure. I just miss the looks of the sweet line of a removable bezel! Don, the 20 is a cool light! I missed the wave because of travel, but I have my trusty Lunasol 27 that is keeping me company. can't wait to see what's next. The low level red has been implemented by Henry in the RA Twisty for night vision support. I thought it would be a real cool feature but honestly not as usefull as I thought. In the case of the Twisty, it can be programmed for a low red or a low white once Henry shares how to program it. I will probably reprogram mine to white. As I just commented in the wave thread, I am essentially committed to the LunaSol 20 going forward because of its form factor. I appreciate the comments made by you guys but most important is the actual performance of the light which most have yet to experience . . .
You can definitely expect a full review from me after I have EDC'd the LunaSol 20 for a month or so, with early feedback and first impressions before that! FWIW, while the LunaSol 20 looks awesome, I definitely am buying it for the combination of flood/throw high/low beams in a small EDC form factor, with a fast acting intuitive interface, in a design that is very well thought out in terms of actual performance, circuit path resistance, ergonomics, etc. Granted, it's sort of "all in my head" right now, but I believe it is an informed imagination of the LS20! I am very much looking forward to experiencing the reality, however! Don can you tell us which golden dragon was used in this light. There seem to be a few of them in white. By the sound of things the L20 may be best in short range interior situations and 20 or so foot underwater. The L27 is best where more overall light is needed and will be better outdoors. Personally I have found the wide beam perfect to illuminating my mixing panel when I do not have a sufficient work light. The tight beam is used for searching for things and generally when I need a more concentrated and brighter light. Funny thing is that the L27 has done such a great job as an edc I was amazed at first. I was carrying the L27 and an E1B and now I am just editing the L27. I wonder how this will change with the introduction of the L20? UNLIKE some people I do have some minimum light requirements. The L27 fits perfectly. The L20 with it's LOWER levels may be even better. I really look forward to lighting up the mix panel with it. the Dragon at 400ma should emit a good amount of light. Hopfully as much as say a mixed mode PD. Don I agree that the Lunasol concept of a light with 2 sources does infact push the envelope. Others may (if they choose) want to play catchup (can they without being accused of plagiarizing the Lunasol?). I have liked the idea of two light sources within the same light for a long time since I first became aware of the Lunasol idea. It is hard to go back. Yes a light can have multiple levels and that is all well and good but two forms of light two completly different beams a wide and tight? This will be hard to accomplish without copying some aspect of the Lunasol design. The L27's reflector is clearly genius. I have a feeling that the L27 would not have sold as well as it did had the L20 been available. As usual your timing and choice of which light to sell when was perfect Don. The L27 got enough of us hooked to want the L20 and the L20 is clearly the Light that the majority of people out here want. Time will be the judge here in showing which light becomes the most popular. I have not heard a negative word about the L27. Except that people would prefer a smaller head. I am not even sure I heard that more than once. Funny I think I saw Bernie say that the Lunasol 27 was Don's best light to date. Now he is saying that again about the L20!! This must be one heck of a light. I don't think the LunaSol concept is new and beyond being a proponent for it, I don't think I can clearly claim any ownership to it. I have always preferred flood as it is my primary need when it comes to light and yet I have been involved in lights with collimated beams because often you don't have enough flux available without concentrating it when illuminating objects at a distance. The idea of having it both ways is no great stretch of the imagination. I have played with the combo numerous times in years past to some level of success or other. Where I think others have missed the mark in similar ideas has been in the choice of sources and optics or actual beam distribution. When the SureFire A2 first came out, I recall reviewing the light and being blown away by it on so many fronts. My only criticism of it was the choice of the tight beam 5 mm Nichia's it hosted. I recall Darell and I giving PK some grief on the now defunct forum (I can't even recall its name) where SureFire lights were the prime topic. Darell and I urged PK to consider using the Nichia 312 LED's at the time. I ended up modding my own A2 with these floody 3 mm LED's to a much better result, IMHO. The UI or means of access and activation are an important consideration in a multi output light and I don't recall exactly when I first considered using the "x2" converter platform for a two source output VS a single source, double drive level output. This proto is a first generation (6 flute) Ti PD host that I installed a Seoul P4 behind reflector and a Seoul 1/2 watt bald headed in. This light works real well but the spill from the P4 and the flood pattern of the 1/2 watt are not concentric and I found that annoyed me. When switching from wide flood to tight throw, you had to change your aim. The poor 1/2 watt LED is way off center and tucked down in the head. This proto was the inspiration for me and I knew I had to do something along these lines. About the time I did this light, as I recall, the new Nichia 310CS was getting sampled and I realized that a ring of them around a central high powered source would provide a concentric pattern even if the individual Nichias had asymmetry in their beam patterns. I also knew I wanted to give the Nichias room around their perimeter to allow them to get their photons out. This was the birth of the LunaSol 27. The LunaSol 27 did all that I hoped it would but there was still the desire for a similar light in a 1" OD head and I knew a 1" OD head could deliver albeit, perhaps not as efficiently. I considered using the Seoul 1/2 watt as the center high power source but at 1/2 watt, it just wasn't high enough in flux for what I wanted. 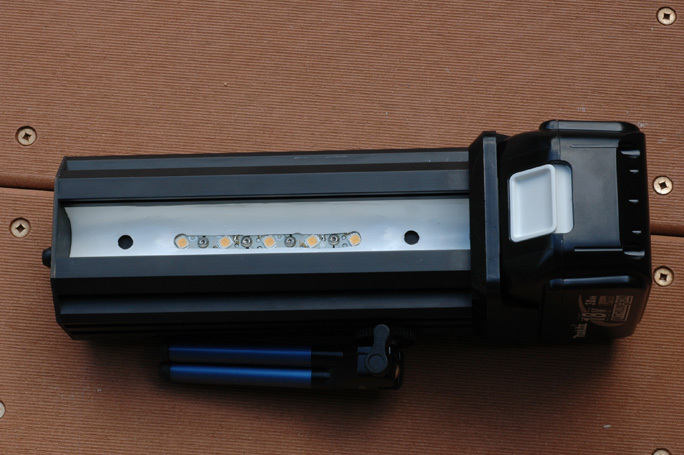 This LED is a really cool part in its own right though and I am surprised we don't find it in a small AA light with serious throw; perhaps there is such a light and I just haven't seen it. Anyway, the Rebel hit the scene and it looked ideal for the role. Before I leave the proto above to its role as a foot note, I want to add that after looking at it and considering its short comings which are solely due to the recessed location in the head, I remember thinking that this combo would be great in a host like the Sten Head lamp or on the front end of a light like Data's SPY where each LED could have its own "pocket" with a concentric (to it) perimeter.The parallax is really nothing and you would have an even overlay of flood and spot. I hope to have future success with the LunaSol program but I don't consider myself to have any exclusive claim to it nor do I think the majority of users would benefit if this concept is not explored and exploited by others beyond what has been done to date. In terms of IP, doesn't Mag own the right to a beam variation from flood to tight spot? They just did it really poorly compared to what can be done! Either their patent was specific to the mechanism and not the concept, or Surefire must be paying them a royalty for their new light. Looking forward to grabbing a LunaSol on a future wave! 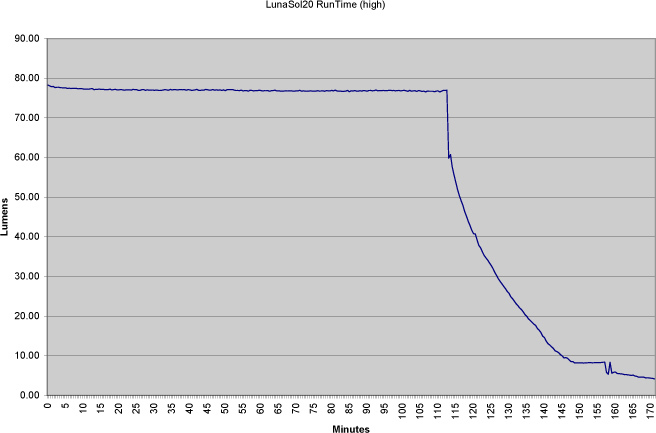 I realized I should document some bench work on the LunaSol 20 and I actually did a runtime test! I should point out that at the end of the graph period, I pulled the light off the Integrating Sphere and the Nichias were still reasonably bright (~5 lumens). The Golden Dragon was off. You can see in the graph that from about 150 minutes to past 155 minutes the BBM was still in regulation and driving the Nichias at their 8.5 lumens just as would be the case on a fresh battery. I turned the light off and after letting the battery rest, turning it back on lit the Golden Dragon for a few moments and the Nichias were also back in regulation for a bit. From the graph, it looks like there is about a half hour of time in which you would have partial power from the Golden Dragon as well as full power from the Nichias. With typical intermittent use, I don't know what the results would be like. I also wanted to document the thermal behavior of the LunaSol and I did a set up which I believe gives a fairly accurate picture. The thermal image was taken after the LunsSol 20 had been on for about 15 minutes. I don't believe the light would get much hotter with a longer on time but I didn't confirm this during the test. The suspicion is somewhat supported by the runtime graph above where it looks like the brunt of the flux drop is within the first 10 minutes. With a light on and sitting like this, the ultimate thermal relief is left primarily to convection and radiation. Interestingly enough in doing some research on emissivity I came to find that titanium has better emissivity than aluminum does. Oxidized aluminum is better than unoxidized and oxidized has an emissivity of .2-.4. Titanium can range from .5 up to .8! 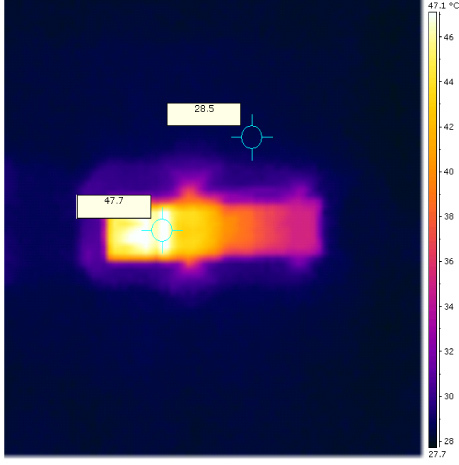 A black body has an emissivity of 1. Now what this means in real world application is simply beyond me! With a surface temp of 47C, I don't know what the die temp would be but I suspect it is well within limits. In terms of the Lumen measure above, the way I now have my integrating sphere set up, I believe it is within 5-10% of real world. If this sample is middle of the road it is probably a reasonable bench mark. I love the simplicity of the LunaSol prototype PD. It is always cool to see how something is taken from concept to reality. While the LunaSol lights are very refined, and clearly well designed lighting tools, there is a certain coarseness to the PD proto. I love it. Thanks for sharing the run-time graph, too. I like seeing that flat regulation! NICE! Awesome! Good stuff. So the 47.7 C corresponds to 117.86 F, and this is definitely towards the "worst case" scenario end of things. If you were holding the light in your hand while it was on, it wouldn't reach this temperature. And 118 F is definitely not too hot to hold in any case. I've run the LunaSol 20 on high for many minutes at a time--well over 10 minutes, although probably less than 30--and the temperature of the light in my hand never got even close to uncomfortably hot. It was just mildly hot. Also, I must confess to an immature delight in being quite close to the mark in my estimate of 80 lumens as the output of the LS20 on high (+low). (sing song voice) I guessed it right. I guessed it right. (normal voice) *cough* Ahem. Sorry. Nice flat regulation of the output. Pleased to see it. Definite contrast to the SF L1 Cree--for the better to my mind. once in hand, I prefer the LunaSol 27 to the LunaSol 20, at least outside and in consideration of beam, the EDC conundrum is what is likely to be in hand. I think for most the size of the LunaSol 20 places it much more likely at being at hand, to be in hand. I really appreciate the slim head/small head design of both the Sundrop & the LunaSol 20. My favorite 'feeling' light is the Surefire U2, but it sees little pocket time because of the large diameter head. I didn't want a LS27 for that same reason, but the LS20 should fit my needs perfectly. 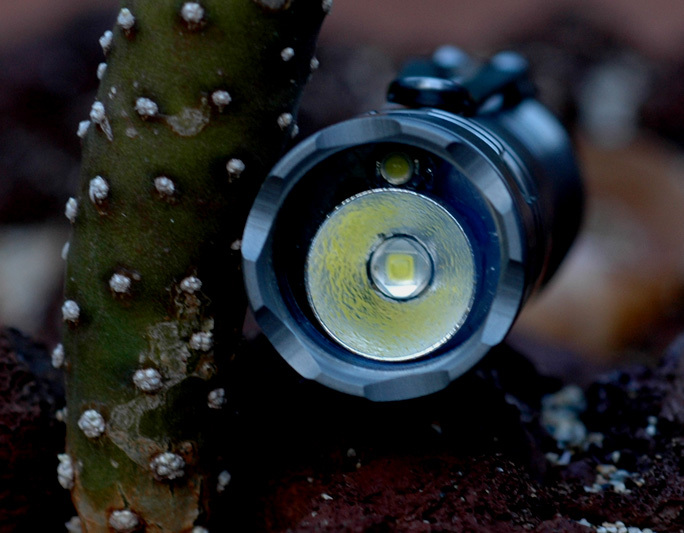 In some ways, the SD & the LS20 remind me of my two 'after work' lights - the Muyshondt Nautilus & Ion. Like the SD & LS20, both those lights have short heads that match the body diameter. If there's a way to keep beam quality & flux where it needs to be, smaller is usually better. Last edited by precisionworks; 06-16-2008 at 11:15 AM. I would really like to get one of the LS20s. Seems like the perfect light. Hopefully well see another wave soon! I guess that for me, perceived output is fairly uniform regardless of the beam's color temp. I've always heard that the higher temps may appear brighter, and since I have relatively low experience with them, gave in to the observations of others without believing my own eyes. I have run the light on high for 10 or more minutes numerous times with the longest being about 1 hour. On high, the head warms up quickly. Not as fast as a LuxIII (Ti-PD) but faster than a Cree (XR-19C Ti). While in the hand, the light got warm, but never warm enough to be uncomfortable. Sitting in candle mode for over 20 minutes, the light did get pretty warm, but again, never uncomfortable to handle. Glad to hear the temperatures are within the operating parameters of the Dragon! BTW, I did notice something I didn't expect. When the battery was almost out of juice and could only power up the Nichia's, I got to a point where I had a dual level low. The light was twisted on to its low position, and the Nichias were on, but dimmer than they would normally be. When I pressed the piston (to see if the Dragon would light) the Nichias went back up to their normal level. Release the piston, and they went back to their initial (lower than normal) brightness. I thought the 3mm ring was independant of the Nexgen board so I didn't expect output to change going from low to high. That is odd!! There are two independent drivers and yet if I follow your statement, when you tried to get the Dragon to fire bringing its converter on line, you saw more power to the Nichias?!?! Could the added demand of the dragon's converter somehow pull more electrons out of the battery to be used by the converter driving the Nichias?!?! Beyond me!! Odd indeed. This isn't the behavior I see at that point. What I see is that I can have one or the other, both at less than normal brightness, especially the GD. I think the reason is the higher output voltage of the Nichia driver, vs. the lower output voltage of the GD driver. To be more precise, this is the chain of events as best as I can remember. Sorry the times are not more accurate, but I was just doing heat test on a partially used battery. Light was twisted on high and in candle mode for 1hr plus. Dragon went out, light still twisted on high. Nichias still going at normal output. Ran in this fashion for another 10 minutes or so. Turned the light off to rest for a few minutes. Twisted light back on to high. Dragon did not fire up, Nichias looked lower than normal. Turned light off to rest for a few minutes. Twisted light to low. Nichias had a lower than normal output. Tried pushing the piston to activate high and the Nichias got brighter. Dragon did not fire. One or the other. That is more along the lines of what I was expecting as well. Tell you what Don when you do a runtime chart you DO A RUN TIME CHART!!!. Not only is the chart impressive. 110 minutes on high is very impressive IMHO. To think of it just a Just a few short years ago getting this much light out of an LED would have been a wonder. Now we do and we do for for almost 2 hours!! The Run time on LOW must be a very long time. The fact that we are getting around 80 lumens from the Lunasol 20 is also impressive to me anyway. I am equally impressed with the temperature measurements and the FLIR image of the light is pretty darn neat. This is not the kind of tool your every day average ordinary flashlight light nut owns. The Lunasol seems to run perfectly cool when held in the hand. I have also run Ming for extended periods of time without feeling the light was getting hot or too hot. I am still hooked on my lunasols as I was when I received them. I have been edcing the L20 on my neck lanyard and the L27 is in the bailout bag (with me at work and close at hand 24/7. I have to admit to carrying my cute little sundrop in a Concealco holster on my belt for the week or so that I( have had it in order to light up everything I see with it, in an attempt to understand it more fully. Maybe a Sundrop runtime chart? complete with a FLIR image would be cool. Gratuitous bump just 'cause I love the graphs and pictures and info in this thread! Wow, after reading this, I want one now MORE than before!!! Don, you are a light genius!!! Has there been any versions of LS27 made that didn't take RCR123? Not that I recall but my memory is a bit suspect. 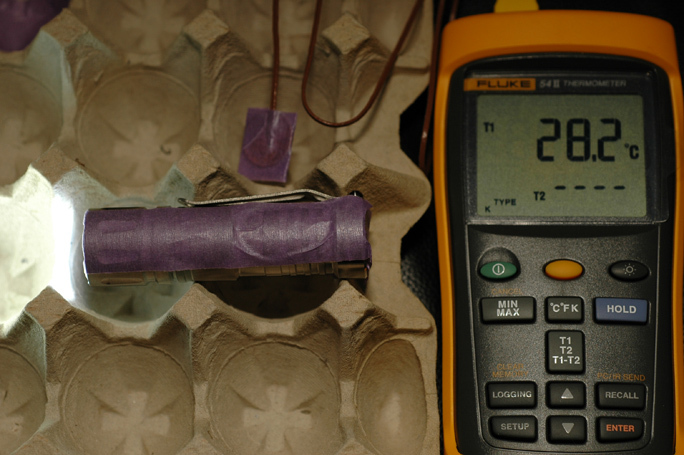 I think there was just one run of LS-20 where I used the NexGen instead of the GD converter for the high power LED. LOL. Thanks Don. Meaning all LS27 can take the RCR123.